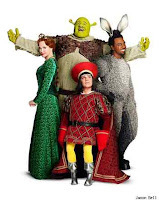 If you want to hear the cast of Shrek the Musical singing their classic hit “I’m A Believer” tune into Britain’s Got Talent results show on Tuesday 31st May ITV1 at 9:45pm. The show is previewing at the moment and due to open at the Theatre Royal Drury Lane on 14th June. Ant and Dec are hosting the second live semi-final when eight acts perform in front of a live studio audience and judges Simon Cowell, Amanda Holden, Michael McIntyre and David Hasselhoff. Amanda Holden is playing Princess Fiona in Shrek and said: "I think one of the most important things when you‘re on a show like Britain's Got Talent and judging other people, is to be willing to stand on the stage and put your own self up for judgment. Next Tuesday, the audience along with my TV colleagues Simon, Michael and the Hoff will be sitting in judgment of me. I‘m just praying they don‘t use their buzzers!"